Parcourez 8 minutes sur des routes bien pavées à travers les forêts d'eucalyptus et des alpages pour arriver à notre retraite de mauka, dans la forêt d'öhia. Ce nouveau lodge est situé dans une ancienne ferme hawaïenne de 20 ans. Bien connu pour son ancienne croissance 'öhia, cette région était autrefois une source de koa pour les pirogues. Ce nouveau lodge est alimenté à l'énergie solaire et dispose d'un groupe électrogène de secours. Il est situé à une altitude de 2 400 pieds, près de la lisière de la forêt. Il offre une brise de montagne fraîche, une intimité et une grande cour ouverte. Une grande salle contient le salon, la salle à manger et la cuisine qui est reliée de part et d’autre à une chambre, chacune avec sa propre salle de bain et une grande véranda. Un trajet de 40 minutes vous amène à la belle ville de Waimea ou à la ville historique de Hilo. Si le temps est pluvieux ou nuageux, vous êtes à 1 heure de la plage très prisée de Hapuna. Plus près de vous, vous trouverez la ville de Honoka'a de style occidental, Laupahoehoe Point, le musée du train Laupahoehoe et le restaurant pittoresque des années 50. Profitez du calme privé et de la faune et de la flore indigènes. Ce sera une aventure! Faites une randonnée guidée dans la forêt et découvrez son histoire. House has that cozy cabin feeling. We ladies spent every night outside on the patio admiring the trees/plants while "the menfolk" grilled our dinner; afterwards we went in to fall asleep to the serenade of the tree frogs. Sorry Susan, but we loved watching the baby pigs come by! Great location to do activities from Waimea to Hilo. Owner was VERY nice and told us all about the area. Would definitely stay there again. Only bad point was the road getting to the property - recommend a 4WD vehicle. Beautiful and remote location to get away from it all. Susan was a gracious host and everything about the home was so peaceful and relaxing for us. Great getaway for the weary city dweller who wants to unplug from the cares of life and enjoy a tropical paradise for a while. Thanks Susan and may God Bless!! We had a great time at your place and we like being in a quiet remote setting. The place was set up nice and no issues while we were there. Abseits der Zivilisation verbrachten wir hier 5 tolle Nächte in einem grandiosen Haus. Susan war äusserst freundlich und gab uns wertvolle Tips für Ausflüge. We truly enjoyed this very private, peaceful and tranquil property. The house has everything you need and feels very homey. The garden and the trees are very well taken care of and make us feel very intimate with nature. We could see the ocean from a distance, listen to the birds, smell the fragrance from the flowers, feel the cool breeze, and gaze the stars at night. It was enjoyable even on a rainy day just to listen, see, smell and feel the rain. Don was so kind to give us an amazing forest walk and we learned a lot. He even picked some Vervain tea leaves from the garden to help my husband with his cold, and it really helped! Susan was so kind and responsive, and she gave us very good suggestions on what to see. Thank you Susan and Don for a wonderful experience. We hope to return someday. Our stay at the Lodge was peaceful and very enjoyable. The house is spacious with an open layout and lots of windows. We love the fact the it is in a remote location, surrounded by lush green sceneries. Yet, we were within a 40 minute drive or less from major destinations suggest as Hilo, Akaka Falls, Waimea, & Waipi'o Valley. Susan gave us excellent directions to get to the Lodge as the road to house is a bit beat up from all the heavy rain they have received this year and was very responsive to all our needs. When the wifi was not working properly, Susan resolved the problem for us in a short amount of time. We appreciated the special care Susan and Don took to make our stay comfortable, working within the constraints of their remote location. Because the Lodge is basically operating off the grid, electricity is obtain through solar power and a generator, and water is from rain catchment. There was absolutely no lack of running water for your dishwashing and showering needs but you cannot drink the tap water. Susan and Don provided ample amount of drinking water, paper towels in the kitchen and bathrooms, & clip lights for areas in the house that could use a little more lighting. 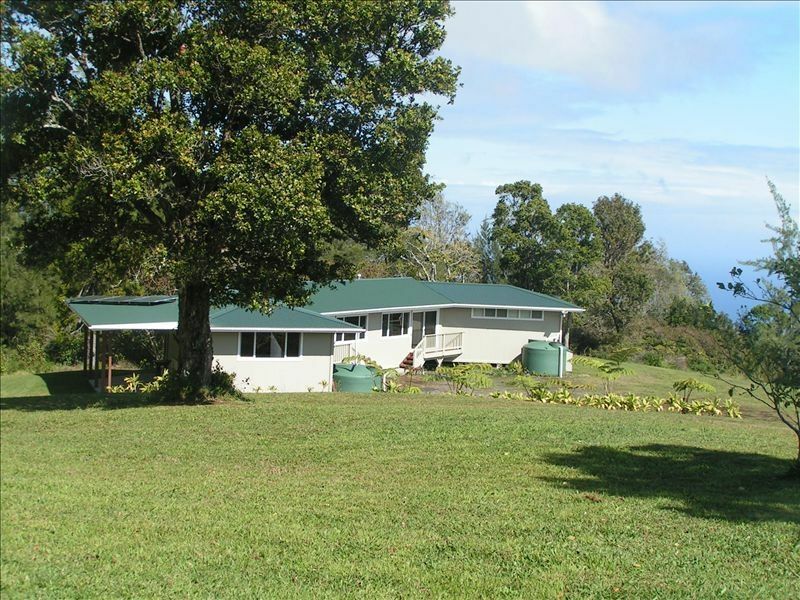 We definitely recommend the Lodge for all who enjoy the peaceful tranquility of a beautiful, pastoral setting indicative of the Hamakua coast area.